Fiji is a terrific area for a yacht charter, with beautiful waters and a unique culture. 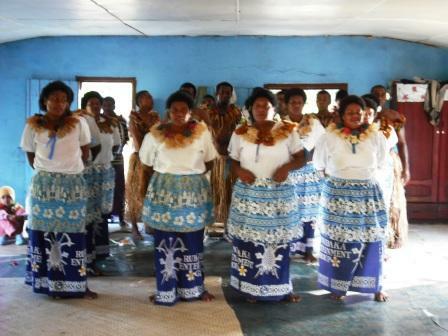 Part of the Fijian Charter Experience is visiting the many villages ashore dotted throughout the island areas. 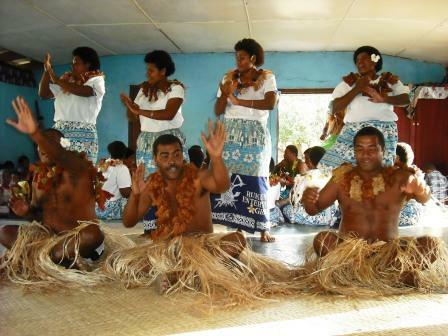 Fiji is a village culture. Each village has a social organization starting with Chief then to Headman and further along with family clan members performing village jobs done for the social good of the village. The jobs are passed down through the family clan from generation to generation as has happened for centuries in each village, and each clan is responsible for training the next generation for the particular family job. Each village has a full hierarchy in place in daily operation. When visiting on yacht charter, permission must be asked to come ashore and visit the village. 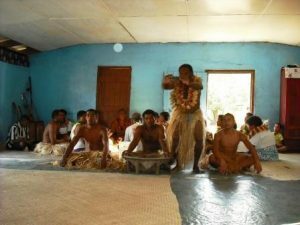 Permission is requested through a Sevusevu Ceremony including drinking Kava, and important visitors are always given a village Meke or dancing ceremony. While cruising on Bel Mare and VvS1 recently in Fiji, we participated in the ceremonial Sevusevu request to visit the village and were treated to a traditional village Meke. “Mo”, our steward on the charter yacht Bel Mare, one day to be chief of his village as inherited from his father, is very well versed in ceremonial village rites. We visited the village of Malakiti on Nacula Island in the Yasawa Islands of Fiji. The Sevusevu ceremony was organized in the village communal hall, with the traditional mixing of the Kava powder with water in the Kava bowl and presentation to our group for a drink one by one from half of a coconut shell. The dried Kava root which pounded into powder to be mixed with water had been brought as our gift for being allowed to visit their village. After the traditional drink of Kava and all ceremonial niceties were made between Mo and the Headman, we were treated to a Meke of traditional dancing by the villagers. A Meke is an honor to have performed as a special guest and might be performed by one village for a visiting Chief or village relatives from another village. And of course, for visiting charter guests, a Meke can always be arranged. The Meke is a series of traditional dances and songs with drums, guitars and ukuleles that have been performed for centuries. Each song and dance has a meaning and tells a story and is performed in traditional Sulas, leis and palm frond skirts. The dance may be danced and sang by the ladies of the village, or young warriors, or the village men. All is a part of the Fijian culture and is a must see to really understand this unique and lovely charter location while cruising in Fiji. For More Information Contact Northrop and Johnson Today!